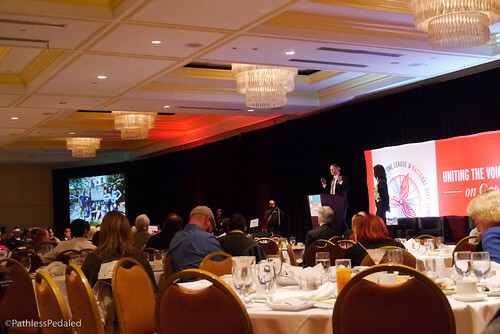 Three full days of countless conversations with fellow advocates at the National Bike Summit has made us realize the importance of bicycle tourism to the larger bike movement. One of the most interesting presentations we saw was by Douglas Meyer of Bernuth & Williamson Consulting, called “Perceptions and Possibilities.” It dealt largely with how bicycling issues, and advocacy itself, are perceived by both bike advocates and politicians. There was sometimes a fascinating disparity about what would make an effective argument for cycling. Some of the themes that surfaced were having good success stories, broadening the coalition of people that support cycling, and demonstrating how cycling can help more than just cyclists. Of course, for us, it seemed obvious that promoting Bicycle Tourism addressed many of these issues. Here are five reasons we feel that bike advocates and tourism professionals have to pay attention to bicycle tourism in the coming years. Dovetailing neatly with the theme of this year’s National Bike Summit is one of the most obvious benefits of bicycle tourism – it’s good for business. Cyclists, like other forms of travelers, require lodging. But, in addition, because bicycling is a physical activity, cycle tourists require food and drink. Lots of it. There are many studies that have shown that bicyclists also tend to spend more nights in an area compared to non-cycling visitors. This is a very appealing detail to destination marketing organizations and convention and visitor’s bureau. It translates to “heads in beds” for a longer duration. Check out some preliminary numbers on bicycle tourism spending in Oregon. Bicycling has typically been discussed from an urban perspective as relieving congestion and increasing mobility. There is no problem with these arguments, except that they only resonate with people who live in cities. There is a vast America that does not live in cities, who are still represented by congressmen and senators who vote on policies that affect all of bicycling. One could argue that they may even have a tendency to vote against cycling, not because they may have anything against bicycling but because it hasn’t been made relevant to them or their constituents. Bicycle tourism can bridge that gap. We’ve sat in on bicycle tourism meetings in Central and Eastern Oregon where, amazingly, business owners from these small communities were heavily invested in attracting cyclists – precisely because cycling had been made relevant to them. The humble bicycle has the ability to bring communities back to life. This is no exaggeration. We traveled to New Zealand and rode the Central Otago Rail Trail and were completely amazed at the power of a 100-mile gravel trail in the middle of nowhere. What was once a dying area of New Zealand has found a new identity through the rail trail. We have also witnessed US equivalents, along Adventure Cycling Routes and rail-trails and mountain bike destinations. Many of these communities are rural and have experienced a collapse of an industry (timber, mining, farming) and are looking for a way to reinvent themselves. Bicycle tourism is a good fit for areas with country roads and basic hospitality services. Bicycle tourism is multi-disciplinary by nature. It means involving not just bicycle advocates, but a wide variety of businesses that are invested in creating the identity of a region (destination marketing organizations, chambers of commerce, business improvement districts). This creates a powerful, broad coalition. One of the lessons we learned in Meyer’s presentation at the National Bike Summit is how important it is to find supportive voices who are NOT cyclists. Bicycle tourism can help find and unite these voices. When a farmer in New Zealand, who used to be skeptical about bicycling, now calls it the most important development in his region “since the gold rush.,” this is powerful testimony! Bicycle tourism allows people to benefit even though they may not be cyclists themselves, and, with the successes, comes a greater empathy and support for bicycling. Ultimately, bicycle tourism is bicycle advocacy. It is coalition-building, with new partners. It is about harnessing the economic engine of bicycling and adding yet another powerful tool to the bike advocacy toolbox. The Central Otago Rail Trail was such an outstanding tourism success that the New Zealand government wanted to replicate it across the country and devoted $50 million to new trail development. Announced under a conservative government, the decision came as a complete surprise to bicycle advocates around the country, who likened it to “winning the lottery.” Interestingly, many of the cycling assets that were developed for tourism could and were being used by locals, making it a win-win. Great article. All these points are relevant wherever in the world you live. The UK charity Sustrans are building a National Cycle Network here and it’s clear to see the positive impact on local and rural communities where traffic free trails are in place. As an advocate of both cycling and those who suffer poor mental health, I have first hand experience of just how much difference good trails can make to somebody’s lifestyle. Similarly, the small rural town where I live gains a great deal from the long distance trail that passes through it. Thanks for all your hard work and commitment to bicycle advocacy, it has an impact much further from hoe than you might imagine. Great celebration of opening of the final link of the GAP in the Pittsburgh, Pa area yesterday, June 15,2013. Excellent idea. I understand Taiwan has been promoting bicycling tourism domestically for years although am unclear about it targeting foreign travelers. I used to run a hostel in central Canada, whereby we knew that catering to cyclists both within the city and from cycle tourists. We found that our efforts were appreciated by the local scene as mush as the touring cyclists from abroad. Some of what we did was, setting up bike racks inside our lobby area to help protect bikes from weather, thieves…a long night in our bar. Also, we provided a bike stand and created partnerships with local bike co-ops and our LBS. The city provided maps and we were able to distribute these for free for our guests as well. The majority of staff rode bikes to work so, it wasn’t a hard sell and they as well were able to lock their bikes inside. I love this post. Yes, bicycle tourism and commuting is so important. There are probably more reasons than the one’s listed! I am biking across America with my doggy, Fiji, in April. And I doubt I’ll ever be able to sit in a car again. Met you in West Newton, Pa. at the RTC hq. Hope you found accomodations that night. Love your story. hola chicos! hablan español? soy de asuncion paraguay, les gustaría conocer mi país?